Could you be at risk of breaking waste management regulations? Could you be breaking waste management regulations by fly-tipping and not even know about it? Before you decide on who you give your waste to, do take note of some cautionary tales around ‘too good to be true’ cheap deals. Those deals could ultimately cost you a lot more in terms of money and reputation. There are regular news items (see an example below) about ‘cheap’ waste operators running the risk of fly-tipping, which in turn can put your business in court and at risk of paying a significant fine. How is that possible? There is a common misconception that because you’re not the fly-tipper, it means you are not responsible. In reality, it is your business that will be held accountable if your waste is found fly-tipped. It is part of your legal responsibilities in relation to waste management to ensure that whoever collects your waste is bona fide and disposes of it correctly. If you don’t know where your waste ends up after it’s collected, it’s time to get that information from your waste collector. If they’re not willing to provide you with this information or without specific details, then it could be a sign that your waste isn’t being handled and disposed of appropriately. Westminster City Council Commercial Waste Services is totally transparent on where the waste we collect from you goes; you can even see for yourself in an infographic. As the infographic shows, all of our waste is recycled and disposed of in the most environmentally friendly way possible and most importantly, no municipal waste gets sent to landfill. We recycle what is separated for recycling and use any leftover general waste we collect to generate heat electricity for London homes and transport. We have little reliance on exporting recyclable materials to the Far East because of our alliances with UK based recyclers. Could you be at risk of fly-tipping? Good deals on your waste can be completely genuine, but if you have any suspicions that your waste is being illegally disposed of in any way, you should stop using those services immediately. This suspected illegal activity should be reported to the Environment Agency which regulates waste management providers. The waste operator is not able to provide you with a copy of their waste carriers licence. You are not provided with a waste transfer note; this is official paperwork that confirms receipt of your waste and where it is taken. The waste operator will not tell you what happens to your waste once it’s collected. The waste operators’ vehicle looks dirty, unsafe and un-roadworthy without company logos or contact details. They do not secure the waste they collect safely in the vehicle. Staff lacks protective equipment like high-viz jackets, ballistic trousers and gloves or operates in unsafe ways. To learn more about waste management regulations and policies in Westminster click this link, you will also find all of our most requested documents including licenses, policies and certificates. The right waste right place information campaign was put together by a group of waste management stakeholders with one aim – helping small businesses and establishments meet their duty of care obligations. The right waste right place campaign’s website is an excellent source of information on how your organisation can meet its duty of care; the website also has numerous case studies on businesses that were found to be illegally disposing of their waste. Westminster City Council Commercial Waste Services is a proud ambassador of the right waste right place campaign. As an ambassador, we have a deep understanding of the importance that businesses have to their duty of care and how their waste operator can help them become more aware of this. Jarno Stet, Head of Commercial Waste Services at Westminster City Council recently spoke about the impact that comes from the lack of awareness businesses have of their duty of care. Now that you know the dangers that come with having your waste illegally disposed of – and what to look out for in case you could be at risk of breaking waste management regulations – it’s time to find a waste collector who can properly dispose of or recycle your waste, legally and without harming the environment. 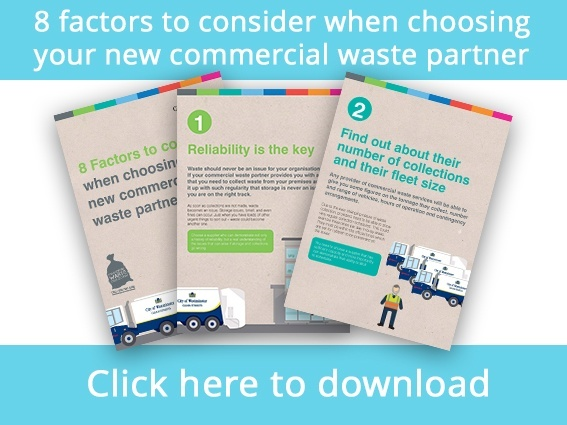 To try and help make your decision regarding a new waste collector easy, we have put together a guide that covers eight factors that you should consider when selecting your new commercial waste partner. As a local authority who provide commercial waste disposal for businesses, we operate at a higher standard than that of many other waste operators. This high standard means that you can always be sure that when your waste is being collected by Westminster City Council, it’s being disposed of in the most environmentally friendly way possible. in addition, it’s important to use a local waste collector, as opposed to one who has to travel far to come in and out of Westminster. As all of our waste is also treated at local facilities, it means that our waste trucks are travelling less distance to both collect, recycle and dispose of your waste, thus reducing the number of harmful vehicle emissions and congestion that contributes to air pollution. To see how you can use our waste collection services in Westminster, take a look at our 5-step ‘getting started’ guide, which offers an interactive way of viewing this process. If you are looking to reduce waste or increase your recycling and want a free, no obligation, waste audit from one of our waste specialists here at Westminster City Council, you can book this by clicking below.